Last week saturday - 22nd Sep. 2012, the first ever Nigerian Makeup/Beauty Industry Live Twitter Chat was held. Bola Fadina - owner of Blush Beauty ; a Lagos based brand focused on makeup and beauty was my guest. We had a lot of participants and I must confess that I was overwhelmed by the participation. The 30 minutes earlier scheduled for the chat was over shot and the chat lasted for over an hour. I was in the store for the chat and took some pictures prior to the chat. @Blushnigeria: This has been a year of consolidation, building up on client base especially in our salon and improving loyalty. @omegiee: What does the Blush range have in regard to makeup products? @Blushnigeria: Everything. Primers, foundations, concealers, lipsticks, brushes, bronzers, eyeshadows and various pro palettes. Pro MUAs get a 20% off discount. @omegiee: How do I order these products and have an idea of how they look? @Blushnigeria: We're planning a road trip to Abuja at the end of October. Will keep you posted on date, time and venue. @piriye: I have heard about Blush Nigeria focusing on professional makeup artists. Please tell us more about that? 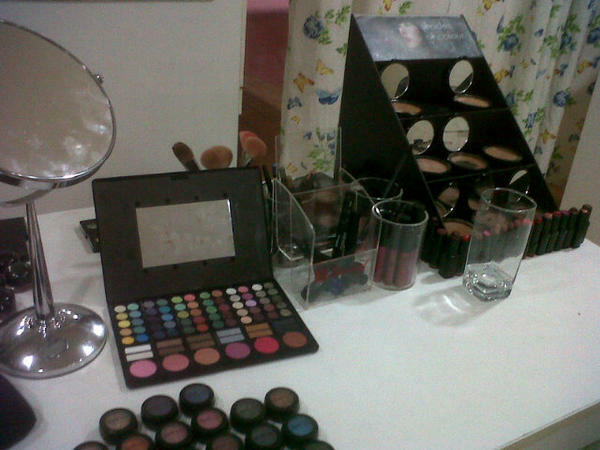 @Blushnigeria: Yes we have numerous Pro palettes and pro friendly prices. We have worked with a number of makeup artists in Lagos and New York. @elimchick: what's the best secret for living in a hot climate? @piriye: mattifying products should be your best friend. @dangeldiva: I got an S201 Shocker lipgloss once from Blush Nigeria. I love it. @funkadelic_tmm2: Hi Bola, I don't know much about you and your product line. @Blushnigeria: We have a selection of hair and beauty products. Some are international but also focusing on indigenous brands. @piriye: Foreign based Nigerian makeup artists are also interested in Blush Nigeria products? How do they get them? @Blushnigeria: We are working on having our products in London and NY. We can deliver to most African countries. @piriye: will it be possible to ship from there to anywhere else? @Blushnigeria: absolutely. We can ship to all corners of the earth. @itsMrCornells: What is your beauty routine on a given day? @Blushnigeria: Gentle exfoliating facial scrub, toner and moisturiser with SPF20. I take vitamin E and fish oil every day. @itsMrCornells: What is your favourite beauty product and why? @Blushnigeria: probably facial scrub. It gets rid of dead cells. It must be a gentle type otherwise it can be harsh and abrasive on the skin. @omegiee: What type of foundation does the Blush brand carry? 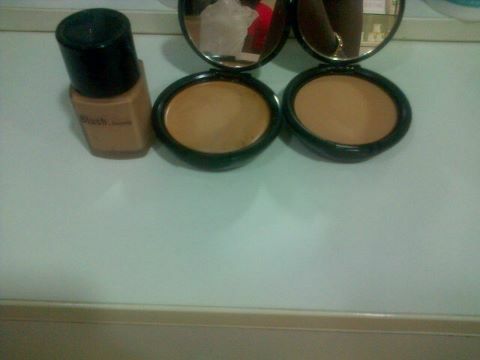 @Blushnigeria: Liquid, cream and also powders. We have 9 colours of foundation. @OYINDA5: Which is easier to manouevre for beginners in makeup use? @piriye: I would say liquid because with a good brush or sponge they glide on easily unlike creams that need proper blending. 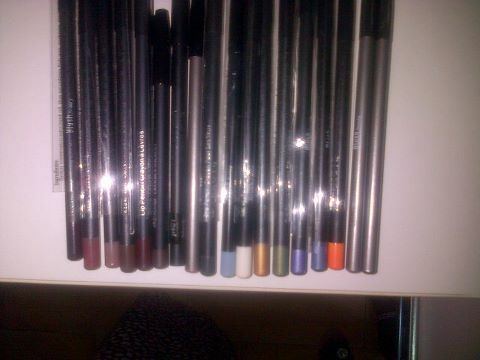 @piriye: There is actually a wide selection of eye pencils available at Blush Nigeria. @yemmyagobs: Hello, what is Blush Nigeria all about? @Blushnigeria: Hair, beauty and cosmetics. Focusing on Nigerian and international brands including Moroccan oil & Mizani. @bellatolina: How do i maintain my natural hair in Lagos heat? @Blushnigeria: You need anti-frizz products and ensure it has enough moisture. The winner of the trivia question - How tall is Bola of Blush Nigeria? was @dangeldiva. Barbara, thanks for the lovely comment! Great blog and lovely post!! Thank you dear and thank you for visiting back. I learnt more than a few tips o. So mattifying products are good for Lagos-type weather? Noted. Speaking of noting, you try sha ... See the pen and paper. Lol! I like your handwriting :-) You even had a heading. I'd say you came ready! P.S. How tall was Bola now? Inquiring minds want to know. Lol, im not even sure I did any of the things i wrote down apart from swatching the pencils. I was very prepared for if we didn't have a lot of participants more like *covering face*. A real doubting Thomas is me. Oh yes, mattifying products are really good for tropical weather. this is probably the first makeup blog i'm coming across and i'm intrigued. how about following each other?? i have a FAB giveaway at the moment pls follow link to check it out.. This is the first makeup blog you are visiting? Waoh. Why is that? Thanks for the compliment and I'm glad my blog was able to give u more reason to visit back. Sounded like a great Twitter chat! O yes it was Audrey. Hopefully you will join us for the next one which is comign soon.